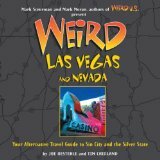 Weird: Las Vegas and Nevada is an extremely fun travel guide for Nevada natives or people looking for things to do on vacation in the Silver State. The book is divided into sections for ghosts and ghost-towns, famous people, mysteries and legends, weird entertainment, and countless other oddities. The stories are short and brief, accompanied by interesting photographs. My favorite parts of the book deal with the history of Las Vegas specifically, especially concerning celebrities and the city's founding gangsters. For Silver State natives looking for things to do in their spare time or even on weekends away from the Strip and the casinos, Weird: Las Vegas and Nevada will certainly keep you busy! Joe Oesterle also teamed up with other writers to publish Weird California: You Travel Guide to California's Local Legends and Best Kept Secrets .